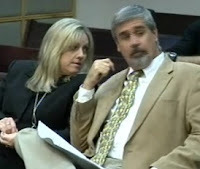 Casey Anthony's defense team filed a Subpoena Duces Tecum asking for materials from searcher/blogger Joseph Jordan. I immediately thought of the number of posts I have all over the "worldwide web" and am at a loss to understand how any person would be expected to track down all the content I have posted! Fortunately, this never came up at the hearing. Jose Baez never got past the pictures in his Q-A sessions with Judge Perry. When the live feed came up, we were treated to the sight of Linda Drane Burdick and Jeff Ashton seated behind Joe Jordan's attorney, William J. McClellan. I thought they looked relatively relaxed as they sat there. Baez said that they deposed Jordan last December 8 and, in order to attempt to discover any bias, they asked if he blogged and asked topics he blogged about. Jordan said he couldn't recall. Baez said that because the defense found him, he suddenly took down his website. He wanted to know everything he posted on the WWW and any photographs he took. He also said that his name pops up throughout the case. He intentionally inserted himself into the case on any number of times. In his summation, Baez said they were looking at his bias and credibility. They wanted to know what was on his website. Jordan's attorney William J. McClellan spoke next. He pointed out that Jordan was deposed for one hour and was asked no questions about photographs. He said that the defense alleged that Mr. Jordan took photographs and that they are of Suburban Drive. As far as blogging is concerned, he is simply a guy who has an opinion. He is not listed by either side as an expert witness where his opinions are going to be relevant. Lots of people state their opinions on sites. McClellan indicated that the defense was harassing Jordan. They wanted him to produce every blog he wrote for the year or so he was doing that. He stated that the motion not sufficient legally. There is no evidence he took any pictures, was in possession of any photographs, or had anything of evidentiary value. The same is true for his blog, which only stated his opinions. There were no grounds for a Subpoena Duces Tecum. Baez then replied by saying that the whole reason they didn't ask questions about photographs during the deposition was that they weren't aware of pictures till they looked at the sites using his "blogging name". Judge Perry asked if, in any of the blogs he read, did Mr. Jordan ever state that he took pictures of the area where the body was found. Were the pictures time stamped with the date? Was it just people in the "blogosphere chit-chatting"? Judge Perry interrupted Baez to say that in an order, Mr. Jordan is a citizen. If law enforcement was attempting to get search warrant they would need to have probable cause to invade that citizen's space. He asked if he said he took any pictures on Suburban drive that would be relevant. Judge Perry said that he wants to know if this is a fishing expedition or does Baez have proof that what he seeks will lead to tangible evidence. Judge Perry then asked if Jordan said he had photographs or did some other person say it? We sure know now the full extent of Mark NeJames vehement defense of the TES records for so long. My heart goes out to those searchers who got snagged in the defense net. Perry then asked if there was anything in the deposition that led to discoverable evidence. Baez said yes, that Jordan had searched the area on Suburban but that he couldn't say he searched where she was found. Perry asked Baez if he know the location? Does he have aerial photographs? During The deposition, did you show the map? The judge asked, "Did he point out the magic area?" Baez said he indicated he'd searched in the general vicinity. The judge asked, "How general?". and he found evidence (blue cooler and blanket) which he turned over to law enforcement, which showed he was close. Baez opined that there was a very strong, or very reasonable argument that he has evidence that could be useful to the defense. Perry asked Baez if he asked Jordan at the deposition if he had photographs of where the remains were found. Baez went through the same argument he had given earlier, that they didn't know about the photographs until after the deposition. He also mentions "advertising" his blog as though he were selling something! Perry then asked if he had said in a blog that he searched in that area and had taken pictures. At this point, Baez lost patience with answering the questions Perry was asking and went on a little rant about how Jordan had changed his story already, committed a felony, took his blog down, changed his story. Finally, Mr. McClellan objected to these accusations. Judge Perry said that all he was trying to find out was if there was basis in fact that court has power to order Jordan to comply with the subpoena. Baez then listed the same stuff all over again, we know he posted pictures, posted on blogs, etc., etc. He then tried to say that the State can get a warrant fast! He has to go through all of this. Perry reminded him that if a person in a case, when the state serves a warrant, he can file a motion to quash. In the end, the motion was denied without prejudice and if he finds sufficient information, Baez can try again. There is a lesson here, folks. Before you ask for something, make sure it exists! It's called doing one's homework and should Baez have found a computer-friendly teenager, that kid would have found out what is really out there on the worldwide web! There are two parts of the defense's subpoena that struck me as odd. Now that you have read what Baez had to say about the pictures, read these two parts of his subpoena. 7. Some of the photographs illustrated areas searched that were near or on Suburban Drive. 8. These photographs are material to the preparation of the defense of the case. If Baez never found those photographs, how can he assert in his subpoena that they were taken near or on Suburban Drive? How can photographs that haven't been seen be material to the preparation of the case? The hearing then changed gears and we learned why the State's attorneys were there. Judge Perry asked Jeff Ashton if he had supplied Baez with a copy of the affidavit (that lists the cost of the sanctions). Ashton said he had mailed it to him yesterday. This section was a bit confusing, so I'm just going to summarize what was discussed. Ashton stated that Baez had e-mailed him that the expert reports could be done in 20 days. Instead of setting one day, Ashton suggested that they be staggered so that he didn't receive them all on the 20th day. He indicated he already had the report from Bock (whose deposition is not complete) and Dr. Huntington would give him a report next week. Baez said that he would be filing papers concerning these reports, that they had discovered "issues". (What could these issues be?) He indicated he didn't want to ask the experts to rush to put reports together so that the State could say, in cross examination, "this is all you can put together in a report?". He again said that they have uncovered several issues and wants 20 days to do the reports. Ashton said that he didn't know what these "mysterious papers" are. Judge Perry said that he had hoped the two sides could have gotten together to make a schedule. He then gave his speech how HE sets schedules. He said that he would be going back in his office and start on making a schedule and it would be something that you all will not like. He added, "I believe there are seven days in the week". Ashton said that he was willing to do staggered schedule and was willing to discuss it. Perry then said that at 3 PM he would start making a schedule. If the wanted input, they were to consult with him. He then reiterated that, "experts examine things and come to conclusions and opinions, they write notes to document what they've seen. It's a matter of translating rough notes and turning them into reports because they deal with one case, but, I'll just leave it at that.". With that, the hearing was over. While addressed to both the prosecution and the defense, I'm sure we will figure out who will be the unhappiest with the judge's schedule for these reports. As of posting, there is no video of the hearing available. If it does get posted, I will add it in. Thank you to A News Junkie and Muzikman at Websleuths. Come on! Why didn't the defense make screen captures of Jordan's supposed photos? So, Baez shot himself in the foot yet again! Will he ever learn? Silly man. Joe Jordan ought to sue for harassment - he didn't deserve what the defense team has put him through! Good Morning & A Happy New Year Ritanita.."I'm sure we will figure out who will be the unhappiest with the judge's schedule for these reports. "..LOL....Indeed it will not be Jeff Aston, he is locked and loaded....It is "painfully" obvious the Jose Baez is not seasoned enough to be handling this case, in fact his Modus Operandi appears to be as shady as his client....In the beginning, Terrance Lenamon was on the mark...and Casey was sucked in by Baez' illusions of "beating the rap" Baez is Lying,cheating and stealing,because this is what his Client wants to be free......PS I really enjoy your site...Peace & Blessings from Florida. Thanks for the comments, everyone. kellygreen, the reason they never took screen captures (if they know what they are)is that they want someone else to do the work for them! donchais, Joe will have to get in line with all the others the defense has harassed and is still harassing. Anonymous from Florida, you are on the mark. Look how fast the realistic Mr. Lennamon lasted! Merker, thanks for the link. Muzikman & Friends are a lifeline for those who didn't get to see the hearing live. Peter Hyatt, thanks for stopping by. I am a fan. Thank you so very much for this article! You saved my life! 10 minutes prior to the hearing we had power outage and our connection went "puff" and I missed the entire hearing, oh boy! Does JB mean that "we no life bloggers" inserted ourselves in the case and therefore we all will be "subpoenaed"? Good Lord!!! Silly fisherman!!! So, defense's experts were expressing their opinions all over the Media about the case and it's okay right? I also feel so sorry for the TES searchers for being involved in this mess just because they wanted to find little precious Caylee and it turned out these lawyers are harassing them and making their lives a living hell! Can you imagine you are trying to be a good samaritan and then you end up having to hire a lawyer? This is so darn unfair! KC's defense should be sued for harassing people. W-h-a-t? Twenty days to do the reports? What issues has defense found now? I can't believe it! If I were JP I would have ordered daily fines of $500, I am sure these reports would be ready in no time. That's how it works when you want things done, I think. I don't even believe JB will pay this fine without a fight, he will whine, whine, whine. I didn't understand how KC could have waived her right to be at the hearing, I though JS had ordered her to be at "all" the hearings. Oh well! FRG, If you haven't found it already, there is a link to the hearing at the end of the article. WFTV sure let us down this time! Chief Judge Belvin Perry today filed his written order hitting attorney Jose Baez with a sanction for a "willful violation" of an earlier court order to turn over expert witness discovery information to the prosecution. Does anyone have a link to the written order? I can't find it in PDF form, would like to read. Thanks. Baez is still being given wiggle room with 20 days. He seems hell bent on NOT turning in those reports. Wonder why? We shall see! Here's the link. You have to cut and paste it. The Judge is giving more and more detail in his rulings - presumably making sure they are not misinterpreted. I was pleased he explained why written reports were now required - but slightly bemused that he requested a copy of the check be provided to the court.